Countdown to Cyber Monday … The Beauty & Style Edition. Alice + Olivia. 25% off the entire site. Ann Taylor. Take 50% off of all purchases. To receive the offer online, code SHOP50 must be entered during checkout. Anthropologie. Cyber Monday customers will receive 50% off of all red-lined sale items from 6:00 a.m. ~ 11:00 a.m.
Athleta. Take 20% off select items in-store and online. Banana Republic. 40% off of all merchandise. To receive offer online, use code CYBER. Offer ends 12/2. BaubleBar. BaubleBar invites you to play Cyber Savings Smash. Using the mallet to bop crazy shoppers out of the way, customers can score one of four amazing deals: 20 and 30 perfect off sitewide, $25 off (orders of $50+), or a $100 gift card. Bluefly. From December 1 to December 3, take 80% off of original retail prices. Bobbi Brown. Get a duo of deluxe-sized samples, a specially-sized lip gloss, free shipping with every purchase, plus your choice of five samples. The Body Shop. 50% off site-wide and free shipping with any purchase of $30 or more. butter LONDON. You know I love this polishes! “Butta” will be gifting customers with 20% off site-wide (excluding product marked at “last-call”) and 50% off “last-call” items. Use the code CYBER13 for online purchases. Effie’s Paper. 15% off personalized stationery. Use promotional code THX2013. Gilt. The name itself speaks exuberance and luxury. Cyber Monday started at 9:00 p.m. tonight with free shipping on everything. “Marquee Monday” brings sales, sales, and more sales (including designer shoes) and a sweepstakes with high-end luxury prizes for 12 winners. Hunter. The tall original gloss boot in Lagoon for $78, only on December 2. Intermix. 20% off sitewide plus free shipping. Intimacy. Buy two items, get one sale item for free. Deals on lingerie, swim, nightwear and accessories are up to 70%. In stores only. Miss Jessie’s. Take 40% off sitewide through December 31. Moroccanoil. Ok, I am not one for putting oil in my hair, wet or dry. It weighs it down too much. “Howeva,” I visited Haute Blow Dry Bar on Saturday morning, and the stylist added a drop or two in my hair before styling, and let’s just say, I am sold. 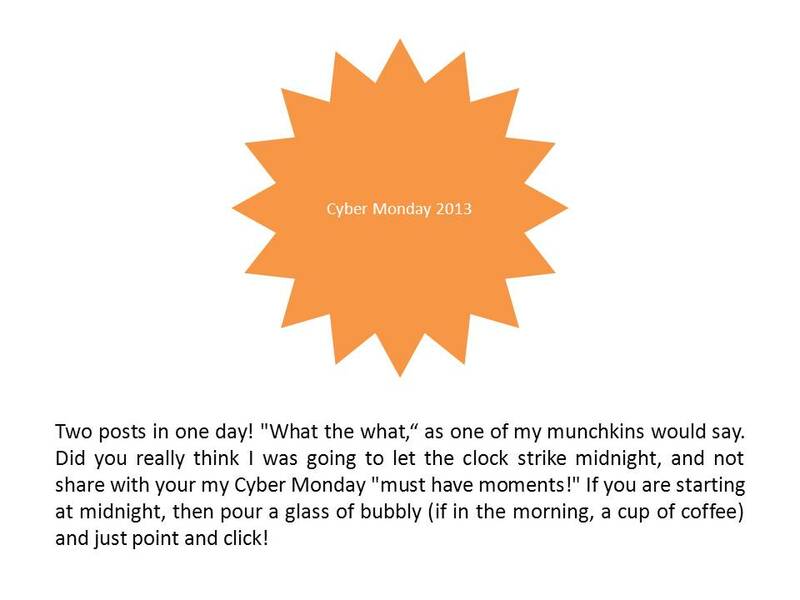 So much so, it had to make the Cyber Monday “must have moment” list. Shoppers will receive a complimentary full-sized products with the purchase of e-Gift Cards. Plus, free shipping on all purchases $55 and up. Shopbop and East Dane. Spend $250, save 15%, spend $500, save 20% and spend $1000, save 25%. Starbucks. Get $25 off purchases of $60 or more. Online only. Tracy Reese. Use code CYBER30 to take 30% off your entire online purchase. Trina Turk. Use the code CYBER13 for tiered savings: spend $200, get 20% off, spend $400, get 25% off and spend $600, get 30% off.